Two of my favorite things about Star Wars are the political conflict and the spiritual conflict. The political conflict was Zeb and Agent Kallus sparring over competing ideologies, with one perhaps convincing the other to reconsider his allegiance. But the deeper conflict, the spiritual one, is a war for the "soul" of the Force itself. The spirit of the galaxy has always been contested between the forces of darkness and light. In "Shroud of Darkness," viewers and characters alike received another masterfully choreographed warning about the outcome of the latest phase of this spiritual war. Having seen the focus on Ezra in the mid-season trailer, I didn't expect Kanan's journey to be as important as it was in this episode. But Kanan's fear was as crucial to the temple's revelations as everything that Ahsoka and Ezra saw. It began with an offhand remark aboard the Ghost, one that Ezra bristled at and that showed Kanan's still-imperfect understanding of what it meant to be a Jedi Master. "I can barely protect you," Kanan told Ezra. For all of Ezra's growth, for all of his maturity, part of Kanan still saw his apprentice as just a kid in need of shielding. But Ezra is much more than that at this point, and it was time for Kanan to acknowledge this. Kanan's overprotectiveness emerged as his greatest anxiety once the three Jedi arrived at the Lothal temple. The mystical dwelling sent each Jedi off on his or her own path, and Kanan was the first to go. At first, I didn't understand the location of the lesson: a training room at the Jedi Temple on Coruscant. But the more I thought about it, the more I realized that Kanan craved the purpose and guidance that the Jedi Order used to provide, and that, without it, he felt uncertain of his role. The Temple Guard who first appeared to Kanan offered sobering guidance: that the Jedi's effort in the nascent Rebellion was doomed to fail, that Ezra's power was growing too quickly for him to control, and that Kanan would fail him as a teacher. "Try to fight," the masked guardsman said, "and you will fail." Given that Ezra later received a similar warning from Yoda, I was left wondering if this would really turn out to be true. On the one hand, always in motion is the future. On the other hand, these warnings about failure clearly portend a serious struggle at some point in the future. Either way, it isn't going to be pretty. Later in the fight, as the Temple Guard advanced on him, Kanan snatched up a second lightsaber, a red one, from the wall behind him. At first glance, this might not seem significant. But consider the context in which Kanan was trying to defeat the guard. Through the persona of this Temple protector, the Force was trying to warn Kanan that Ezra had to make his own choices, and that a teacher's ability to protect his student was limited. Kanan's resistance to the guard signified his resistance to the truth that the vision conveyed. In a frustrated bid to protect Ezra, Kanan literally drew on a weapon associated with the dark side—a fact he seemed to acknowledge with a tiny glance of concern at the color of the blade as it sprang out. The message was clear: resist the necessity of letting Ezra go in the "real world" and you risk falling to the dark side in your desperation. The Temple Guard continued to goad Kanan to test the limits of his control. Verbalizing the lost Jedi's greatest fear, the guard intoned, "You will never be strong enough to protect your pupil." But Kanan was eventually strong enough to accept the truth. He ceased fighting and realize that he couldn't "protect Ezra forever," as he put it. All he could do, he admitted to himself in that moment, was make Ezra the best padawan he could be, so that, someday, he was ready to step into his own as a Jedi. 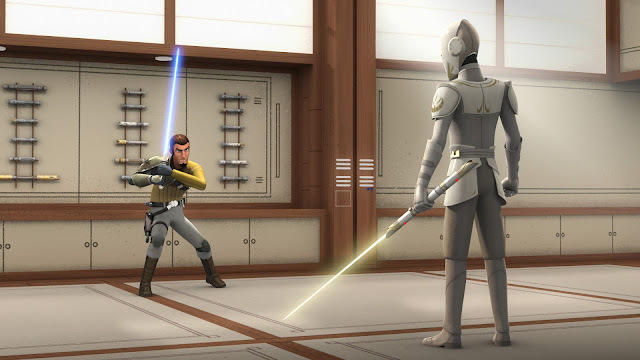 After Kanan admitted his limited ability to prepare and protect Ezra, the main Temple Guard fighting him suddenly ceased his attack and transitioned into a knighting ritual. Having admitted his limits and accepted the fact of Ezra's growing independence, Kanan had passed yet another crucial test. And while the Jedi Order was gone, the Force itself had seemingly bestowed upon Kanan an honor that the Order's fall had precluded: the promotion to full Jedi Knight. But there was a surprise in store for Kanan—and viewers. The Temple Guard removed his mask to reveal the Grand Inquisitor, who admitted that he had once been a Jedi Knight. Kanan's shock mirrored my own. Out-of-universe, it was an excellent way to add depth to a previously two-dimensional character. In-universe, Kanan's former nemesis was now more complex to him. He could no longer write off the Grand Inquisitor as a simple tool of evil. The man had undergone a conversion; there was a history there, a path he had taken away from the Jedi Order and toward the Sith. Kanan, like the viewer, saw this "bad guy" in a whole new light. Thus, even after his death, the Inquisitor's past became more interesting and mysterious. If the lesson for Kanan was that he had to accept the limits of his abilities, the lesson for Ezra was that he had to accept the dangers of his. At the beginning of the episode, in an effort to escape the Inquisitors, Ezra used the Force to call to the flying creatures on the planet they were scouting. He did it almost effortlessly, reflecting his growing power; his frustration at struggling to connect to a Loth-cat many episodes ago seemed like a distant memory. But this benign reflection of Ezra’s increasing mastery of the Force underscored the danger that lay ahead. Inside the Lothal temple, after hearing Ahsoka wistfully describe Jedi Master Yoda, Ezra suddenly vanished from her sight and appeared in a star field that he recognized, where Yoda appeared to him. In another reflection of his increasing Force abilities, he could now see Yoda instead of just hearing him. But the Jedi Master echoed the Temple Guard's warning to Kanan about the perils of Ezra's strength. He told Ezra that his new strength meant new danger. But Ezra didn't seem to appreciate how important this warning was. Because while Kanan's fear was his inability to protect Ezra, Ezra's fear was his inability to make a difference in the brewing conflict. Like Luke Skywalker a decade later, Ezra wanted to fight the Empire and seemed to bristle at Yoda's cryptic warnings against violence. Yoda, having seen so much in just the last two decades, laughed at Ezra's simplistic notion of winning, explaining how the Jedi had been blinded by the shroud of the dark side and how their choices had doomed them. Ezra didn't see the relevance of this to his own struggle. Like many other Jedi—and many Star Wars fans—Ezra sought guidance for using violence in a noble way without succumbing to the lure of the dark side. He couldn't just sit around and let the Empire's yoke settle onto the galaxy's shoulders. Yoda reminded Ezra that winning wasn't a simple notion; instead, it was about how one chose to win. Recognizing that Ezra—as much an Empire-hating street-rat-turned-resistance-fighter as a Jedi-in-training—felt compelled to fight, Yoda offered him a morsel of guidance with immense resonance in the broader story of Star Wars: "find Malachor." Anyone who read The Force Awakens Visual Dictionary will know that the design of Kylo Ren's crossguard lightsaber dates back to the Great Scourge of Malachor, which occurred thousands of years prior to the events of that movie. The midseason trailer showed Ezra wielding a similar weapon, making Malachor a major touchstone of this real-world era of Star Wars storytelling. I have no clue where this is all going, but I'm thrilled to see it happening. Rebels didn't just peer forward with this brief mention of Malachor. It also peered backward. And if Ezra's upcoming literal journey to Malachor already feels portentous, Ahsoka's figurative journey into her past life felt tragic. As much as Rebels is really about Ezra, Kanan, and their crew, Ahsoka has always occupied a larger-than-life presence on the show since her arrival, and it's gratifying to see the writers continue to pay that off with new hints about what she knows and what she feels. Anakin Skywalker occupied Ahsoka's mind during the events of this episode, from the Ghost to the temple. Hearing Matt Lanter reprising his role as Anakin was an enormously powerful thing, both as a fan of The Clone Wars and as someone invested in Ahsoka's continuing journey. In the former context, the hologram of Lanter's focused, confident Anakin recalled memories of Jedi heroics and quieter moments between master and apprentice in the previous series. In the latter context, every second that we were hearing Anakin's voice was also a moment in which Ahsoka was forced to dwell on what had happened to him. As Ahsoka meditated to the sound of Anakin's training holo and described her former master to Ezra, angelic music and unspoken tension filled the air. The music made the scene feel eerily tranquil, but the dark events known only to one of the room's occupants also made it feel emotionally fraught. The way Ahsoka reflected on Anakin's life and service to the Order—and to her, personally—was so beautiful, enhanced by voice actress Ashley Eckstein's masterful delivery. Yes, Ahsoka said, Anakin was as powerful as the legends held, but he was also kind in a way that those legends couldn't capture. As Ahsoka reflected on his compassionate side, it was impossible to miss the sadness in her voice. She knew that all of that was gone. But if I'm reading this episode correctly, Ahsoka had also known for some time—as many fans suspected—that Anakin had become Darth Vader. The first clue came in that initial scene between her and Ezra. When he asked what happened to Anakin, she didn't really answer him. All she said was that she remembered seeing him run off to rescue Chancellor Palpatine from the Separatists—a nod to the opening of Revenge of the Sith that will no doubt stoke speculation about where Ahsoka was at the time—before "everything changed." Her response never directly addressed Anakin's fate. Ahsoka's experience in the Lothal temple seemed to add enormous weight to the idea that she has known Anakin's fate for a while. Like Ezra and Kanan, she confronted her deepest fears, doubts, and anxieties. Her greatest fear was her former master's disapproval. Her deepest agony was his disappointment. And while she didn't regret leaving the Order, she did wonder whether her departure had contributed to Anakin's fall. And in the most powerful moment in the episode, Ahsoka was forced to confront the reality of what Anakin had become: the mask, armored Sith Lord pursuing her and her new friends. Ahsoka reacted with visceral anger and despair at the stark realization that this was undeniably true. She couldn't lie to herself about Anakin or couch her mental image of him in outdated memories of his kindness. For all her strength and wisdom, she was still deeply troubled by Anakin's fall. Her need for reassurance after this troubling vision prompted her to turn around as the Jedi fled the temple and glimpse Yoda sitting on a branch, smiling at her and waving. That brief moment was full to bursting with important subtext. As far as Yoda and Ahsoka knew, they were two of the three Order 66 survivors with a personal connection to Anakin. Their brief exchange of warm feelings was like a mutual effort to buoy each other's spirits. Yoda was bidding her good luck on her journey to help these newly emerged Jedi right the wrongs of the past generation. She was affirming her commitment to the task at hand, trying to push away thoughts about what that might entail. It was a beautiful moment, and I couldn't help but think about the fact that, like so many Jedi who grew up around Yoda, Ahsoka simply loved seeing him. His presence reminded her of simpler times—safer times. Let's talk a little bit more about Yoda. Many lines in this episode recalled the wizened Jedi Master's journeys at the end of The Clone Wars, in the final story arc of the "season 6" bonus content. "When I was young," Ahsoka told Ezra, "he seemed happier." That changed as the war progressed, she said, "as if he knew before anyone else that one time was ending and another beginning." Listening to that last part, I remembered Yoda's acceptance, in the very last episode of The Clone Wars, of the need to accept the futility of the war and prepare for a new reality. Yoda saw things that no other Jedi glimpsed, and those lessons informed his changing demeanor. We saw all of this happen from his perspective, and now we were hearing about it from Ahsoka's perspective. Yoda's conversation with Ezra offered more chances to delve into the past, especially when he literally played clips of The Clone Wars—and even a shot from Attack of the Clones, in an unexpectedly direct connection between the TV and movie worlds—for Ezra. This was obviously his way of illustrating the dangers of war, a chance to link the darkness of the present to the unseen warnings of the past. In a bonus-content episode rich with allegory, Yoda confronted his fears and emerged more confident about his own mental and emotional discipline. In an attempt to impress upon Ezra the importance of discipline, he obliquely referenced this particular journey. His point was that dangers are often invisible until it is too late, and that Ezra should avoid pressing his powers to the limit in the service of what he might believe is a good cause. In an episode brimming with lessons for characters, there was also a nice reminder of the elusive nature of the Force. The Lothal Jedi temple seemed to have its own conscious, protective spirit. Kanan commented that the new doorway paired with their new set of problems, but while he might have meant this flippantly, it seemed very true. The mountain, at the behest of the Force, had allowed them access to a new area of the temple so they could learn new lessons. Combine this with Ahsoka's decision not to help open the temple owing to her ex-Jedi status, and one really got the sense that the mountain contained a living energy. Access to the temple also provided a contrast between the Jedi and the Sith approaches. Whereas the Jedi used the Force to ask the temple to open up, the Seventh Sister and the Fifth Brother used technology to scan the mountain and then forced their way in. It was against the temple's will, which is why the temple fought back. The red lines and circles that appeared on the ground as they forced the mountain upward reflected the fact that the temple feels violated, and it made the Sith acolytes pay for their trespass by fighting back once they were inside. I love visits to Jedi temples, because so little of what happens within them can be explained by logical means. To Ahsoka and Ezra, Kanan simply vanished when he began his lesson. Ezra, too, later vanished while Ahsoka was describing Yoda to him. She looked up and he was gone. Ezra opened his eyes and he was somewhere completely different. All of this defied rational explanation. Yet that is perfectly in keeping with how the Force, as a supreme presence in the galaxy, works. Characters often comment on it, and both The Clone Wars and Rebels have portrayed it with impressive consistency: the Force works in mysterious ways. "Shroud of Darkness" will no doubt resonate for years to come based on the things that it set in motion. Darth Vader may have only been in one short scene at the end, but one of his two lines conveyed the gravity of the path facing the Jedi. When the Fifth Brother commented that Ahsoka, Kanan, and Ezra were getting stronger, Vader replied, "It will be their undoing." Did Vader's remark reflect what the temple guard warned Kanan about—that Ezra's growing strength would prove to be a liability? Will Ezra, as the guard predicted, be "consumed by it"? That remains to be seen. What we can say at this point is that "Shroud of Darkness" was an immensely fun, fascinating, and thought-provoking episode, thanks to a combination of beautiful and sobering imagery; precise, faithful dialog; and mystical, incomprehensible, and vital lessons imparted by the Force.